The Golden Palm Weaver was formally described by Jean Louis Cabanis, a German ornithologist who was an assistant at, and later the director of, the Berlin University Museum. 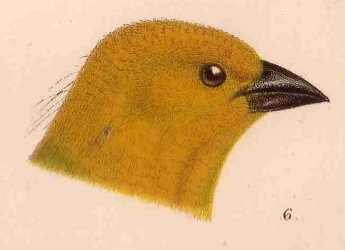 Cabanis based his description on 2 males and a female weaver collected at Mombasa, Kenya. These specimens were collected by Baron Karl Klaus von der Decken, German explorer of eastern Africa, on his expedition to climb Mount Kilimanjaro. 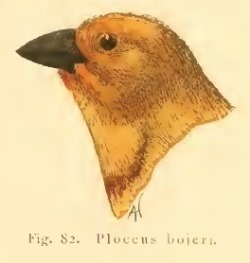 So, although the weaver specimens collected by Bojer are not Golden Palm Weavers, the scientific name is not an anomaly, as Cabanis named it after Bojer for his general collecting, and not for collecting the Golden Palm Weaver specifically. Identification. The Golden Palm Weaver is a common weaver of the coastal palms in East Africa. The black eye is in striking contrast to the orange (male) or yellow (female) head. The adult male has the head uniform orange, shading to a chestnut patch on the lower throat - in the similar male Eastern Golden Weaver the orange face pales onto the ear-coverts and sides of the neck. The Golden Palm Weaver shows no seasonal change in plumage. 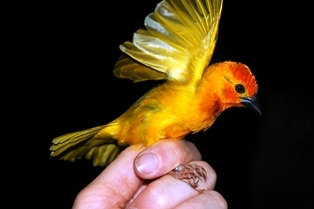 The subadult male has a yellow head with developing orange on the nape and lower throat - the similar Taveta Golden Weaver differs in having a well-defined occipital crescent and rufous upper breast, and their ranges do not overlap. The female Golden Palm Weaver is entirely yellow below (the female Eastern Golden has a white belly) and the back is indistinctly streaked (heavily streaked in Taveta Golden Weaver). Distribution. 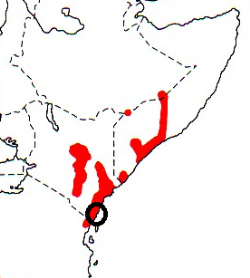 The Golden Palm Weaver is found on the East African coast, and inland, from Kenya to Ethiopia (see map right, based on Birds of Africa). 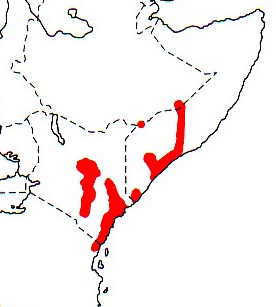 There are few records from Ethiopia, near the border with Somalia. In Somalia, it occurs on the Jubba and Shabeele Rivers and in Boni Forest. In Kenya it is found on the coast and inland along the Tana River, with a separate localized inland population. Records from Tanzania are now considered misidentifications and the species has been deleted from the Tanzanian list. 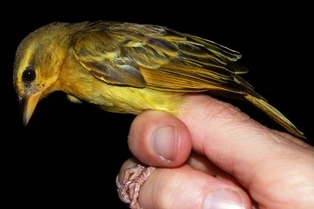 No subspecies of the Golden Palm Weaver are recognised. Habitat. The Golden Palm Weaver inhabits palm savanna on the coast, as well as riverine habitats and it extends into savanna in areas below 1200 m and with more than 500 mm annual rainfall inland. Food. Food consists of seeds and insects. The Golden Palm Weaver is gregarious and roosts in flocks when not breeding. Breeding. The Golden Palm Weaver is colonial, and suspected to be polygynous. It may occur in mixed colonies with Eastern Golden Weavers or with Village Weavers P. cucullatus. The male displays while hanging below the nest entrance, with his wings spread vertically, but wings usually move very little; the head may be bowed slowly. The nest is spherical with no entrance tube. The male weaves the outer shell of long grass strips or strips from palm fronds and builds a complete inner shell of short grass strips. The female lines accepted nests with leaf fragments and fine grass heads. Nests are usually suspended under palm fronds or over water in thorn trees. Clutch size is 2. The eggs are green, mottled with grey or reddish markings; sometimes eggs are white, overlaid with fawn. The introduced House Crow Corvus splendens raids colonies for eggs, young and adults in Mombasa.